And then there are those Berkeley Square houses about which little is known of the appearance of the actual buildings; no photographs or drawings or specific newspaper real estate notices from the period have surfaced regarding 8 Berkeley Square as of yet. 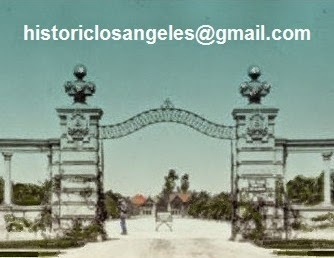 The house was unusal in that it was built late in the history of the Square, and of West Adams a whole, the older parts of which had begun emptying of the city's Old Guard and professional classes a decade before when newer northerly and westerly suburbs began to draw them away in force. By and large, if any new upper-middle-class house was going to be built at the very depths of the Depression, it would have been in, say, Windsor Square, or perhaps on the flats of Beverly Hills. The original building permits for the house and garage issued by the Department of Building and Safety to attorney John Page Crutcher on February 7, 1933, describe it as a 13-room brick-veneer dwelling. No doubt it was of sober design, most likely symmetrical, perhaps something in the stripped-down Georgian Revival, or perhaps neo-French, with applied detail, that was less architect-designed than something off the table of a contractor's draftsman, which #8 does appear to have been: Building permits indicate that there was indeed no architect of record, with J. Ernest Randall of Beverly Hills cited as the builder. We would venture to guess that the 80-by-250-foot Lot 25 had been retained by the Burkes next door at #6 from the opening of the subdivision until the time of construction of #8, when perhaps they needed a cash infusion; in its quaint column "Here and There With the Society Tattler" by Peek N. Ease, the Times reported on July 3, 1932, that the John Page Crutchers had just bought and were soon to build on the empty lot between the Burkes and the Sterns. The Crutchers were in their commodious five-bedroom, five-bathroom house about a year later. Even if more information about the house was available, no doubt it would serve to paint only the most genteel of pictures, one that would strive to be in accord with the presumed dignity of the proper haute bourgeois Los Angeles that kept its distance from movie folk and such as the unseemly publicized will battles of, say, the Llewellyns and Milners of #7 across the Square. The Crutchers' parties at #8 that society writers did manage to cover were few and far between, with the entertainments sounding somewhat less than, shall we say, energetic. Tea was poured every so often to club ladies, but some Berkeley Square families seem to have adhered more closely than others to the rule of allowing one's name in the newspaper only three times. 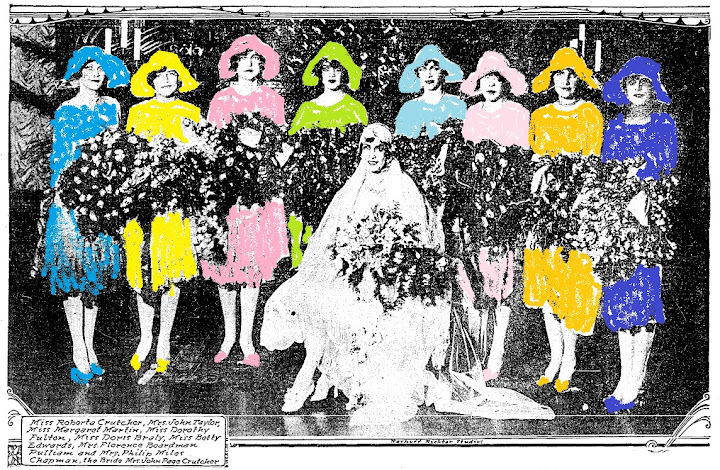 It was a downtown office-and-club world for some—and a Junior League, volunteer-work world on the distaff side, with fox furs with heads biting tails (and, later, circle pins), which was about as chic as things got in matters of dress in certain Berkeley Square households, such as #8. But here is proof that it is the family living in a house that tells the story, regardless of the building itself. Tea parties, yes, but then there was that colorful wedding of the couple who lived here for 20 years.... More on that in due course. 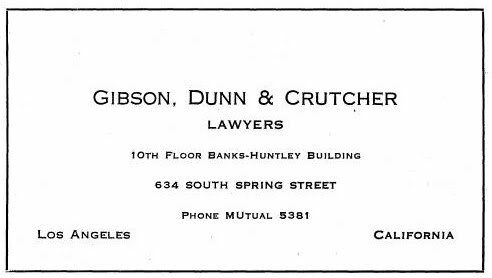 Following the wedding, the young Crutchers lived first at Hermosa Beach, which before freeways would have been quite a long commute for John to Gibson, Dunn & Crutcher's downtown offices—perhaps he was practicing on his own at first. By 1929 the couple was back in Los Angeles at 2404 6th Avenue, seven blocks west of the Square and in a neighborhood of what might be called starter houses popular among young marrieds of traditional bent, making the short move to the much grander #8 in 1933. 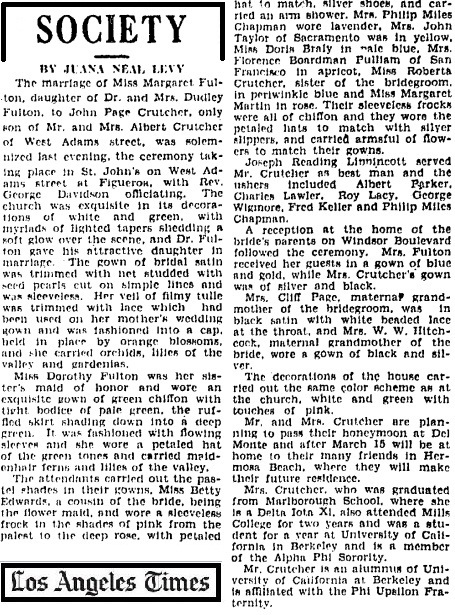 They had two sons, James Page Crutcher and John Fulton Crutcher. 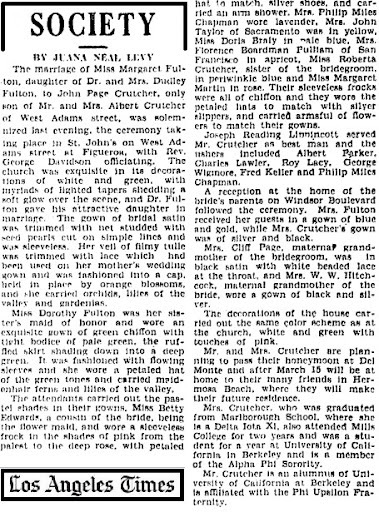 Marge Crutcher gave her occasional teas, and once even a rather lively dinner party at #8 (the guests didn't leave until 11 o'clock); along with her mother-in-law she helped out at the annual Doll Fair—benefiting Children's Hospital—at the Phillipses' down the street (later held at Marlborough School). And so life seems to have gone at #8 until sometime around 1956. James, by now a Princeton graduate, married a Seattle Junior Leaguer that year and moved north. His parents were still listed in Berkeley Square in the 1956 city directory with their housekeeper, Leola Baxter, but, of course, change was in the air. John's mother's death at her long-time home at 1257 West Adams on October 8, 1954, was a sign of the times in terms of the moving on from the district of the old ruling class. The Times classifieds for June 30, 1957, listed #8 for sale, "Price Reduced." The Crutchers and Leola moved to 400 North June in Hancock Park the next year, that neighborhood having become the destination of many an old West Adamsite since the subdivision opened in 1920. It was here that John Page Crutcher died on September 26, 1960, age 59. His West Adams roots were not forgotten—the funeral was held at St. John's. Son John married a Visalia girl in 1962, later living in The Netherlands with his second wife. Marge Crutcher and Leola were at 400 North June into the 1970s. On December 9, 1985, leaving her two sons and five grandchildren, Marge was called to her reward by way of St. John's—and so the steady but definitely remarkable Crutchers remained, at least through their church affiliation, loyal West Adamsites for over 85 years. A June 13, 1957, classified ad in the Los Angeles Sentinel offered #8 for sale, and, interestingly, refers to it as a "newer house"—well, actually, having been built in the '30s, it was much newer than the first houses to be built on the Square. In any case, it appears to have been sold to the Reverend H.B. Charles of the Mount Sinai Missionary Baptist Church. (Then on East 82nd Street, Mount Sinai now occupies a former Christian Science building on West 54th. 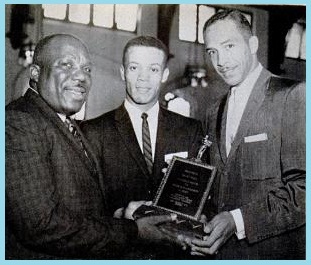 In 1990, Reverend Charles's son Reverend H. B. Charles Jr. succeeded his father; at the time of his appointment Reverend Charles Jr. was a 17-year-old student at Los Angeles High School. He served for nearly 18 years before being called to Florida.) The September 1960 Baseball Digest reported that the great shortstop Maury Wills, who had come west with the Dodgers, was living with Charles's family in their "12-room parsonage" on the Square. Number 8 disappeared from city directories after 1960.
the Mt. Sinai Missionary Baptist Church in 1963.